The Commission on Narcotic Drugs (CND) is the policy formulation body of the United Nations on drug issues and meets in Vienna every year. For two weeks, from the 12th of March, countries, NGOs and scientists are gathered in Vienna, Austria to take stock of the current illicit drug situation and to define the way forward. You can follow the process in this web page. The formal meeting of the Commission on Narcotic Drugs (CND), the policy formulation body of the UN on drug issues, will take place in Vienna 17-21 March. Before that there will be a series of meetings, many of them feeding into the CND deliberations. The main objective of all these exercises is to prepare for the UNGASS 2016; The United Nations General Assembly Special Session in New York. Here is the official web site of the event. The meetings in Vienna these two weeks are organized by the United National Office of Drugs and Crime (UNODC), in collaboration with WHO, other UN agencies, The Vienna NGO Committee on Drugs, governments and civil society organisations. FORUT is part of the process, as member of IOGT International’s delegation. In 2009 the member states of the United Nations adopted a Political Declaration and a Plan of Action with the aim to strengthen the global community’s efforts to reduce drug problems. At UNGASS 2016 the time has come to look back on what happened since 2009 and what should be done next. At a side-event to the CND session in Vienna a new international NGO network was launched on the 18th of March: Drug Policy Futures. Read more here. 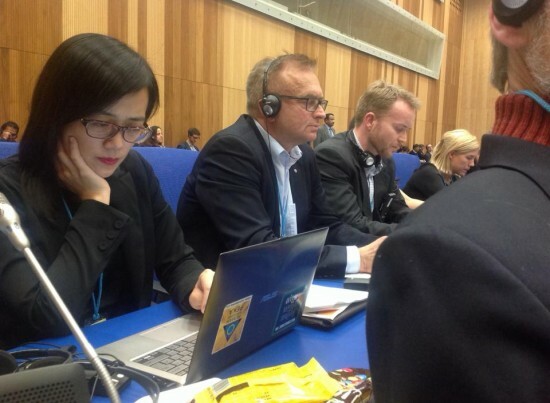 The first task of a public health-oriented drug policy is to prevent drug-related problems from occurring, said President of IOGT International, Sven-Olov Carlsson, in a statement at the CND session on the 18th of March. Carlsson used his intervention also to introduce the new Drug Policy Future initiative. The IOGT President (with headset in the picture to the left) said that “Environmental strategies that discourage drug use and reduce the availability of illegal drugs are a central element of prevention. Community-based strategies that promote drug-free environments and supportive social norms are shown to reduce the use of both legal and illegal substances. Environmental strategies should be supplemented by education and evidence-based prevention as well as more targeted interventions that reach high-risk groups and problem drug users”. By looking at the documents below you can follow some of the developments taking place in Vienna these two weeks. The oldest documents are at the bottom and the newer at the top. The principles of Drug Policy Futures. The Joint Ministerial Declaration from the High-level Meeting, 12-13 March. 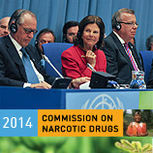 Status report on the global drug situation from the UNODC Executive Director.